Let’s face the facts. Like 99% of the American population, you probably don’t floss your teeth as often as you should. The majority of dental patients actually confess that they don’t even floss at all unless there is something stuck between their teeth. The American Dental Association recommends cleaning between teeth DAILY with dental floss or an interdental cleaner. Unlike brushing, flossing reaches between teeth and helps treat and prevent conditions like tooth decay, gingivitis and periodontal disease, which can lead to tooth loss. Gingivitis is an early and reversible form of periodontal or gum disease. Dentists, hygienists and product manufacturers have been trying to find a way to motivate patients to floss for years. The answer has finally come in a method that patients of McCarl Dental Group will both enjoy, comply with, and that is as effective as traditional flossing: the water flosser. For years, products such as the Waterpik were recommended to patients with hard to reach areas around bridges, crowns, implants or braces. Recent studies show this method of plaque removal even more effective than flossing. (1) Many of our patients say that the water flosser is easier to use than dental floss. The Waterpik Water Flosser is an oral irrigation device that delivers a steady stream of water and can flush out food particles, bacteria and plaque from under the gums and between teeth, where a toothbrush can’t reach. For those who find flossing difficult, now a gentle stream of water can do the job. The added convenience of water flossers can also increase patient compliance in maintaining their oral hygiene. The result will be healthier gums, teeth and maintenance of oral appliances such as braces, bridges and implants. You can purchase the Water Flosser at Bed Bath and Beyond and Target. Oral irrigation devices such as the Waterpik Water Flosser are available in various designs. The lower end models usually deliver one steady stream of water, while higher ends allow more customization in the pressure through manual controls. The water reservoir may be filled with a comfortable temperature of water to ensure patient comfort. While it may take a little getting used to, many people prefer water flossers to traditional floss because of the convenience and ease of use. For patients with limited dexterity, flossing can be challenging. 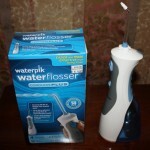 The Waterpik Water Flosser is easy to use. Dr. Clayton McCarl is currently using the Water Flosser for hard to reach areas before he flosses. McCarl Dental Group wants to encourage and promote oral health for each of our patients. Part of that responsibility includes making you aware of successful products that can help achieve improved oral health. If you’re looking for a dentist, we would love to invite you to our office. Our Millersville dental office is conveniently located near Severna Park, Annapolis, Crofton, Crownsville, Gambrills, Glen Burnie and Severn, Maryland. Our Greenbelt Dental Office is close to College Park, Lanham, Seabrook, Bowie, New Carrollton, Laurel, Glen Dale, Bowie, Mitchellville, University Park and Hyattsville, Maryland . To schedule a preventative care appointment with us, call our Millersville, MD office at (410) 987-8800 or our Greenbelt dental office location at (310) 474-4144. You may also schedule a dental appointment with a dentist at McCarl Dental Group online at www.McCarlDental.com. Comments Off on What is Water Flossing?